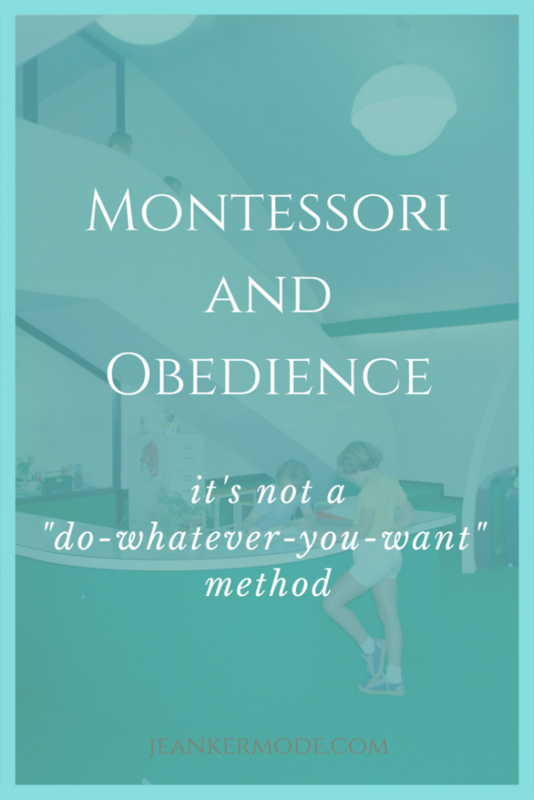 Montessori and obedience: These words do belong together! 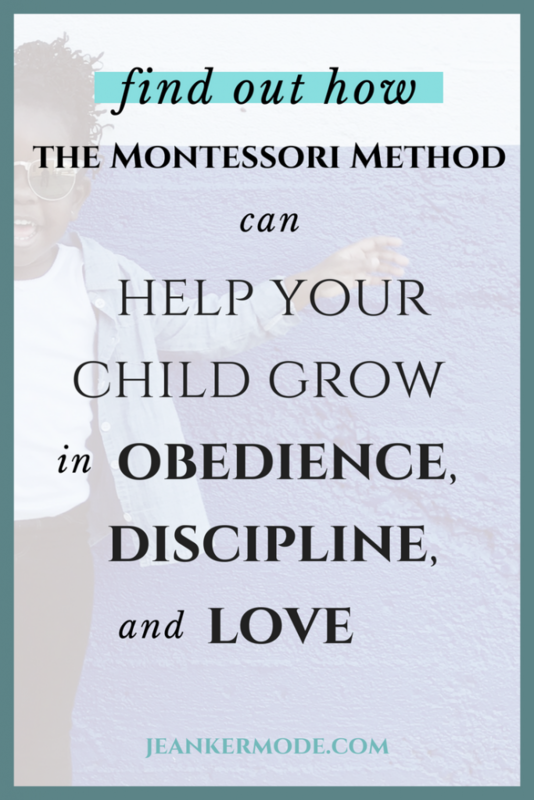 I want to help you understand the relationship between a strong will and obedience, and I’ve included some Montessori discipline tips, too. When you hear “Montessori,” do you picture a slightly chaotic mess of children, wandering around, doing as they please? A little girl over here pouring water all over the floor, perhaps, or a little boy over there snipping the leaves off the classroom plant? Luckily for everyone involved, this is not what it means to follow the child! Obedience, that sometimes neglected and forgotten virtue, has an important place in the Montessori philosophy. Let’s take a look at what Maria Montessori has to say about obedience and how to get it. With Montessori philosophy, it’s super important to understand the laws of nature before we try to jump into any quick tricks and fixes. I’m also going to break it to you now: there aren’t really any quick tricks and fixes. There are practical measures we can take, but it’s crucial to understand what’s really going on first. So first, when we say obedience, what exactly are we talking about? Are you thinking what I’m thinking, though? Sometimes kids just don’t do what you ask them to do. Where’s the magic, Maria? We can think of obedience as wielded by the teacher who rules with an iron fist, commanding every action of her supposedly incapable students. The child in this situation has two options: totally give up developing her own will, or use her will to battle the teacher’s. Both are bad. Or, we can think of obedience as part of a natural development. When a child is given room to develop her own will, (and a little self-discipline to boot) she will learn to obey out of free choice and love. That’s the one we want. We don’t want blind-obedience, servitude, or closed-mindedness. Neither do we want rebellion or chaos. We want our next generation to have the discipline, will, and humility to recognize and follow the wisdom and leadership of others when needed. Let’s dig a little deeper into the idea of obedience as part of natural development. During the first years of life, a child creates and develops his mental organs. (It’s a lot like how he created and developed his physical organs in the womb.) “Both knowledge and will have to be created,” (The Absorbent Mind, p. 19) which means that at first, the child does not have a will. This is called the first level of obedience. The child obeys his natural impulses, because he does not have the consciousness or will to obey his parents or caretakers. If you’ve ever begged an infant to stop crying, you get this. He can’t. At least not until you take care of whatever the problem is. In other words: the child needs to develop his will so that he can obey you. As with all organs, mental and physical, they develop through exercise. For the first three years or so of life, the child creates and then exercises his will, and he gradually becomes more conscious of himself and his actions. So during this period, the child might obey you one day, and not the next. Practice makes perfect, it doesn’t start with perfect. Little kids have to practice walking, until one day, they can walk perfectly, every time. It’s the same with obedience. We just have to allow them to practice. The second level of obedience goes along with the next level of development. If the child is able to develop her will through practice, she is now able to obey you all the time. She is using her will to follow your will. This is awesome, and it’s what most of us consider the final goal. But, Maria Montessori noticed an even higher, more beautiful level of obedience. The third level of obedience goes along with an even further level of mental development. The child now also becomes conscious that you know and want what is best for him, and he decides that he wants that too. Before, the child might have obeyed you reluctantly, because he really did not want to clean up after himself. Now, though, he obeys you with eagerness. He wants to clean up after himself, because he knows that you know what is best for him. Now that we understand that obedience is part of the natural process of mental development, we can take a look at how to help that development. I mentioned above that the child uses his will to reach a desirable form of obedience. And he develops his will through practice. Sounds very cool, but what does this “practice” look like? Avoid making “better” decisions for the child after he has already chosen. You may think milk tastes better with peanut butter and jelly sandwiches than water does, but that really doesn’t matter. When the child starts to develop his will but then feels it being overridden, he will naturally resent this. He then either combats your will with his own, or lets his will weaken. Avoid swaying the child’s decision with your own preferences. See above. See how that works? It takes time, but gradually the child strengthens his will and starts to obey you. Win win. The third level of obedience is really a matter of love. The child’s will and understanding play a part, but who would so willingly give their will over to someone they don’t love, and who doesn’t love them? So love your children and your students. This doesn’t mean spoiling them or giving them whatever they want. It means giving them what is best for them, even at your own expense. It means being happy to see them. It means being patient with them. It means telling them you love them. Your child will learn to love from you. Don’t stress about your child getting to this third level. No one is perfect, and everyone needs time. But do believe that your children are capable of amazing things. I’d love to hear from you! Share your tips, thoughts, or questions about obedience in the comments. I respond to each and every one!